Nestled in a box canyon surrounded by the majestic, 13,000+ foot peaks of the San Juan Mountains, the over a century-old Town of Telluride is filled with colorful legends and Rocky Mountain spirit. Just six blocks wide and twelve blocks long, the National Historic District is a window into the town’s illustrious past with its colorful Victorian homes, clapboard storefronts, boutiques, art galleries, bookstores, and gourmet restaurants. The backdrop of this historic town is Telluride’s World Class Ski Resort, featuring a free gondola that provides free transportation between Telluride and Mountain Village for skiers & pedestrians alike. 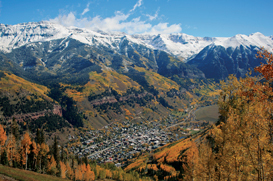 A year-round paradise, summers in Telluride are highlighted by such renowned festivals as the Telluride Bluegrass Festival, Telluride Film Festival, and Telluride Blues & Brews Festival, just to name a few.